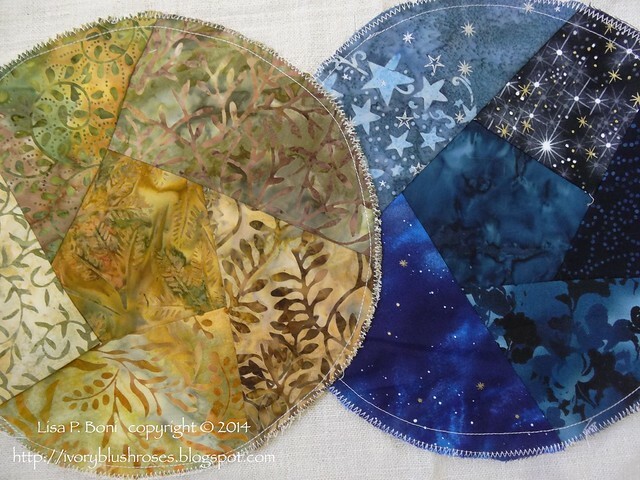 One of my very favorite Crazy Quilters, Allie Aller, nominated me to participate in the Around the World Blog Hop! The four questions allow us to share a bit more about us and our creative process so you can get to know us a little bit better! 1. 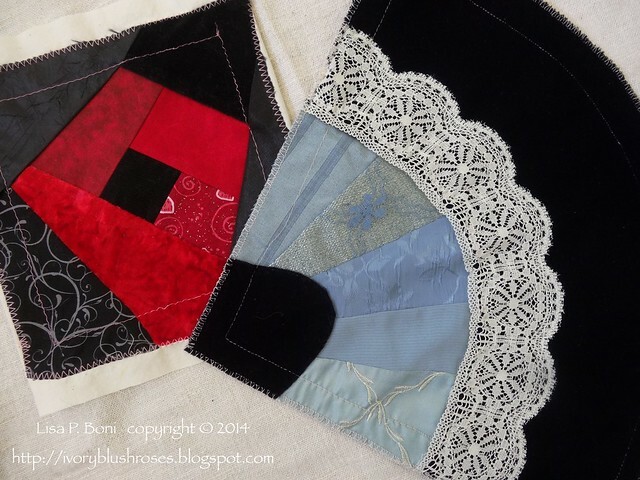 What Crazy Quilt/Sewing things am I working on? As with most people who create, I have several projects going at any given time, but generally find myself working primarily on one of them at a time. If I get bored or find myself blocked, then I switch to another project for a while. Here are a few of the thing in my WIP (Works in Progress) Basket. I love participating in round robins and find that they inspire my creative process. I have a host of these projects that need finished and compiled into completed form! There are a few current round robins that I am in that have blocks that need stitched soon. 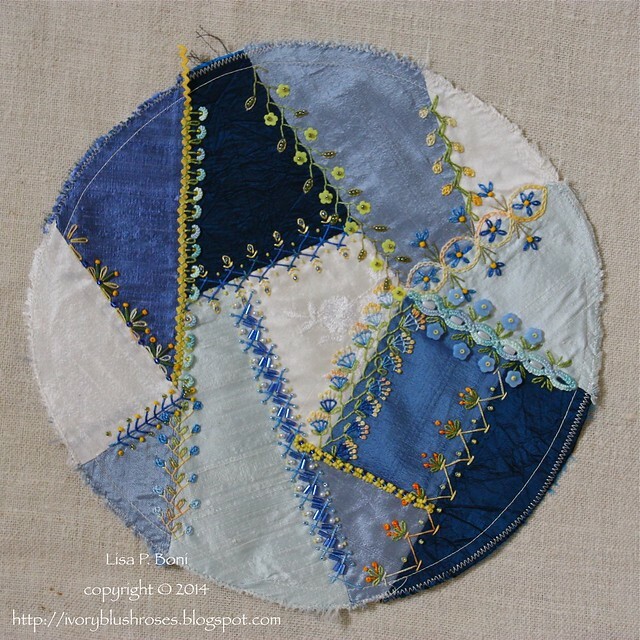 As my frequent readers are aware, I've been working on a CD pincushion each month for the Crazy Quilt Journal Project 2014. It has been lots of fun! Having a yearlong project like this has been great motivation to keep stitching and I have loved seeing how my pincushions have evolved throughout the year! There are only two more pincushions to finish this year! I'm already thinking ahead to how I would like to participate in CQJP 2015. It probably won't be pincushions though! I have a few big "slow" projects in the works. 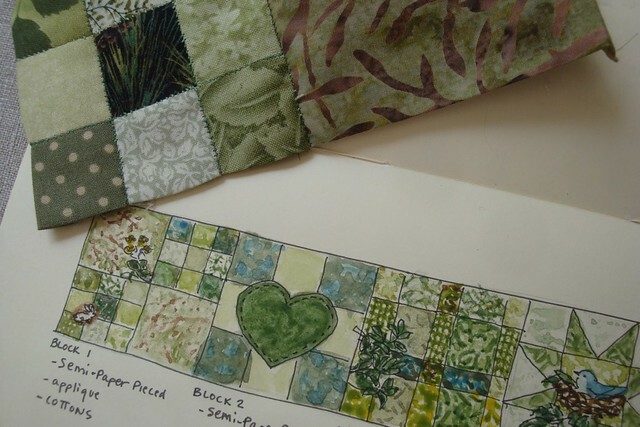 I've been working on this woodland quilt sporadically since 2011. 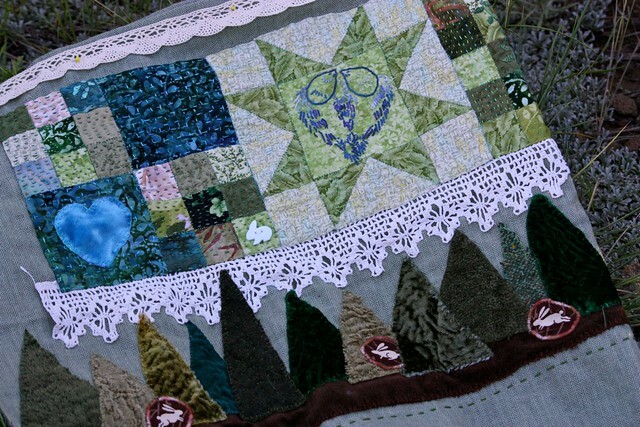 When I finished my Woodland Bunny purse, I realized I wanted to make a lap quilt with a similar theme because it was so tactile that I really wanted to snuggle up with it. Most of the squares are one inch. It takes a LOT of 1" squares to make a 12" square and many, many more to make up the foundation for this quilt. There are 1,296 squares in the center 36x36" center! The entire quilt will be about 45" to 50" square when completed! That's a lot of hand stitching, so this isn't moving very quickly. This is a fun project that I am getting ready to begin. My Aunt Anna created a huge number of these quilt wheels. More than I would ever be able to finish. 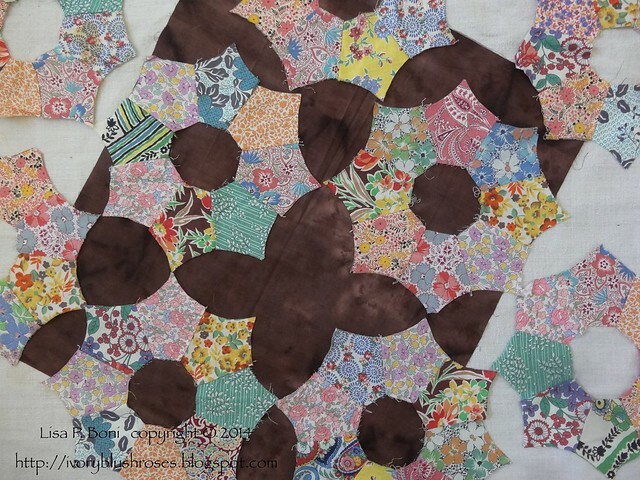 I sent the majority off to Allie Aller as I really love what she has been doing with her combinations of traditional and crazy quilting. There were so many, that she shared them with Valerie Bothell. I kept back 9 of them to make a small wall hanging. Allie came up with the fun idea of having all three of us work on our own projects simultaneously to see how we would each interpret them. Right now we are waiting for the timing to work out for all three of us to have time to work on them at the same time. I'm definitely the "slow" one in the bunch, so I've been hard at work thinking about how I want to proceed so I don't slow them up! 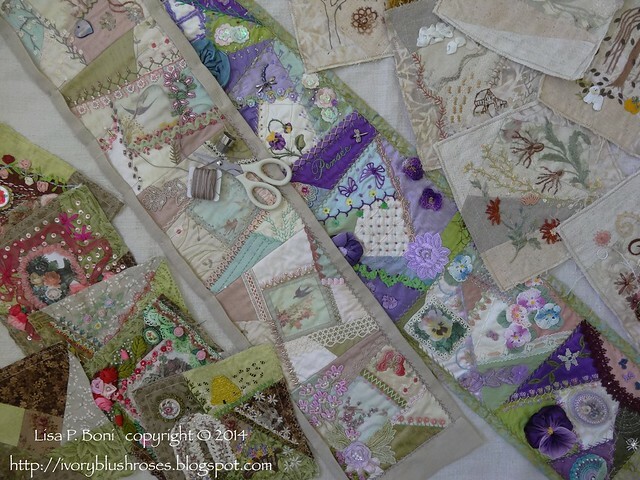 I think that this is going to be my CQJP 2015 project ~ a wool folk art themed crazy quilt. This was inspired by a vintage CQ that was posted for sale on e-Bay earlier this year. I fell in love with the graphic stitching and the boldness of it. Around the same time, I found a rug in the IKEA catalog that had a similar feel to it. I sketched out some inspirations, played with different color-ways and have stitched two "sample" blocks to try different styles of stitching on, which will help me figure out which direction I want to take this quilt. Eventually, it will hang in my guest room and become the focal point of the room. There are some smaller projects in the works ~ this years Christmas card design, which incorporates a block print that my Mother created many years ago. This fairy block is taking so much longer than I ever thought it would because I keep getting distracted by other projects. I made the morning glories on my June Pincushion as a learning process before making the white moon flowers for this block! If you go back to some of my early January 2014 posts, you'll see that I have an entire basket full of unfinished blocks to work on. I'm really good at starting things... not so great at keeping at it until I get them done! Though I am trying to get better about that! 2. How does my work differ from those of its genre? I really love the stitching on the old crazy quilts and feel that aside from the "crazy" piecing, it's the stitching that really makes them what they are. In our modern day crazy quilting, we've gotten away from stitching and more into embellishing with lace and trims and other doo-dads. I find that the more crazy quilting I do, the more I return to the stitching. 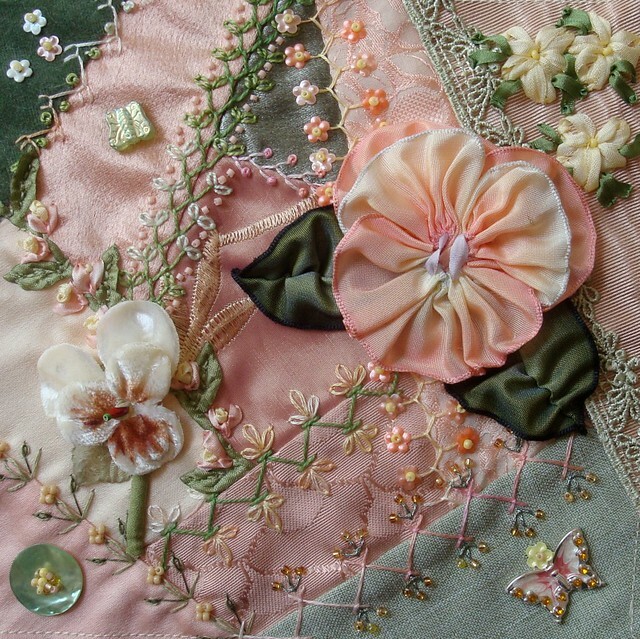 Even if I am going to use lace or trims on a block, I nearly always embellish all the seams first. 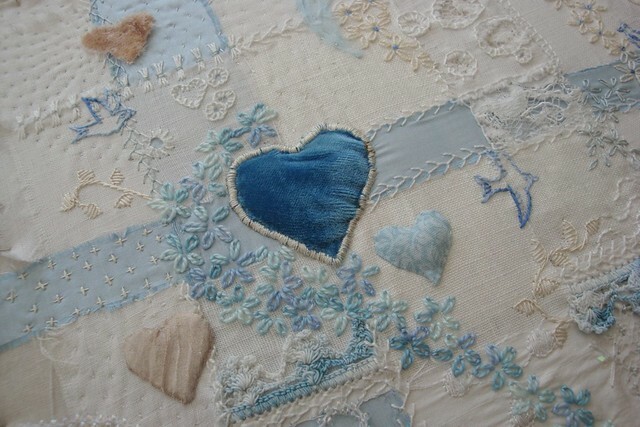 I also love bringing something dimensional into my crazy quilting and that has inspired me to learn new embroidery techniques such as stump-work and Brazilian embroidery techniques. I am very inspired by the work of artists such as Salley Mavor and Susan Pilotto. I also love to incorporate other techniques such as fabric weaving, paper piecing, etc., with boho or kantha type stitching to add texture and interest. 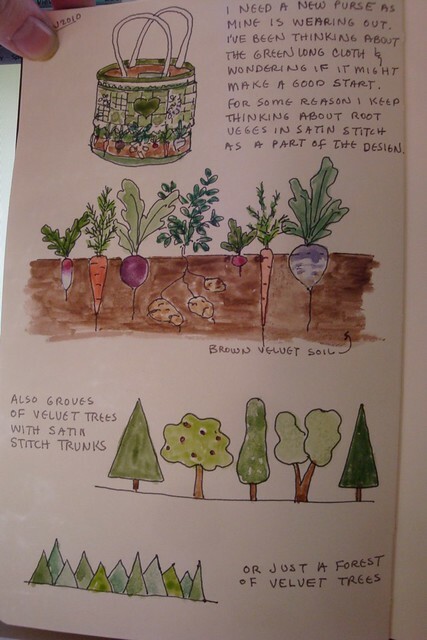 Jude Hill has been terrific inspiration for incorporating some of these precesses into my stitching. Stitching small square of folded fabric together in a pseudo paper-piecing technique has become on of my favorite techniques. It is slow meditative work that I love. The added texture and interest when combined with kantha type stitching makes it wonderfully tactile and brings a depth and intrigue to it that sparks my imagination. In a nutshell, I create because God created me. I believe that we are made in the image of a creator God, that we were created to create. By creating, we honor that gift and can use it to bring glory to God, to be witness to him. Philippians 4:8 says, "whatever is true, whatever is honorable, whatever is just, whatever is pure, whatever is lovely, whatever is gracious, if there is any excellence, if there is anything worthy of praise, think about these things." By nature, I am a quiet person, somewhat shy and reserved. I am a lover of nature, of peace, solitude and quiet. My faith is the foundation of all that I do and create. I revel in the beauty that is revealed around us daily, no matter where we are. When creating, whether it is crazy quilting, painting, or some other form of art or handcraft, it is my hope that these creations will nourish hope and peace and that they will encourage people to seek out the wellspring of all life. I try to create items that are lovely and gracious, that uplift those who observe and interact with them. As an artist, I seek out the beauty in life, from the grand vistas to the minutest details. Regardless of what it is, when something catches my eye or triggers a response in my heart, I simply have to capture that moment and share it with others! This is a question without an easy answer! 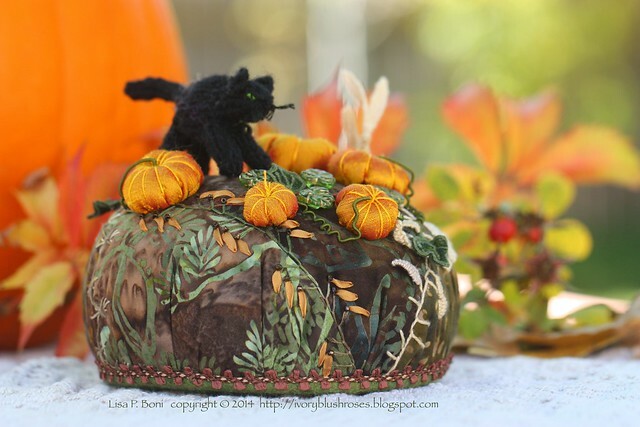 Creatively, I am involved in so many endeavors, from photography to crazy quilting and embroider, watercolor and oil painting, to sewing, quilting, scrapbooking, spinning, knitting, weaving, candle-making, baking, writing and endless other handcrafts. None of them exist in a vacuum and I find that each one brings something to whatever project I am working on at the time. A sketchbook and pocket watercolor set along with a camera, are my nearly constant companions. When something sparks my interest, I try to capture it with a simple sketch or photograph. It might be a tiny detail, like the pattern of raindrop splash on the windshield of the car, the play of light through the clouds, the layers of light and shadows in the evening landscape, the colors of the grass or leaves. The corners of my papers, from work notes to sketchbooks, post-it notes, index cards, and even napkins or paper towels get little things drawn on them. 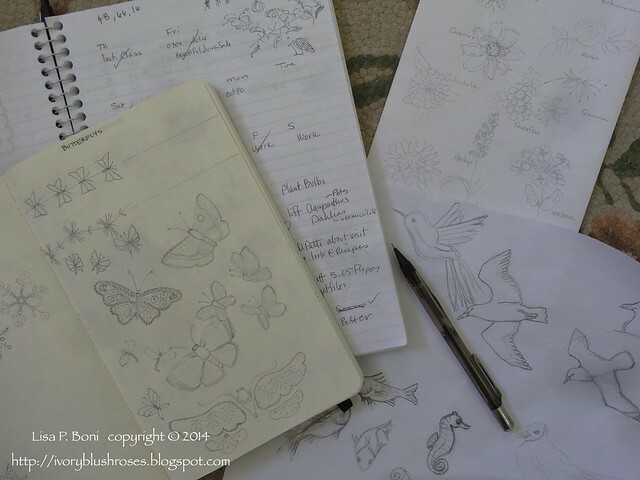 I'm definitely a visual thinker and sketching things out helps me in the creative process, even though the finished item may not look at all what the initial sketches looked like! As you can probably see from my sketches above, it is nature that inspires me the most, but I also keep files of magazine clippings, a generous Pinterest portfolio of ideas and am always watching for things that inspire me. One of my favorite authors has said that her writing evolves with the characters, that she doesn't know where they will end up but that the story grows and evolves with them. That's how I feel about my stitching. I may start with an idea, a theme, or a color, but then it grows from there. Once I begin a project, I think about what the finished item will look like; what colors, stitches, and size it will be. Occasionally, I will sketch out a concept for a completed project, through once finished, the project rarely is a complete match from where I started. As I work through ideas, I make little scratchy sketches in the corners of whatever paper happens to be handy ~ the back of envelopes, my to do list, my notes at work. This helps me work out problem areas or figure out how to pull something together. As I start working, the process flows rather organically. I let one seam inspire the next and when I'm stumped, I refer to my seam idea book for inspiration. Any planning that happens is generally focused on concept. The details grow and change as the project progresses. One of the reasons I love working on round robin blocks is that it gets me out of my comfort zone and pushes me to work with colors and themes that I typically wouldn't work with, like the peach and yellow block above that I stitched for Carolyn. 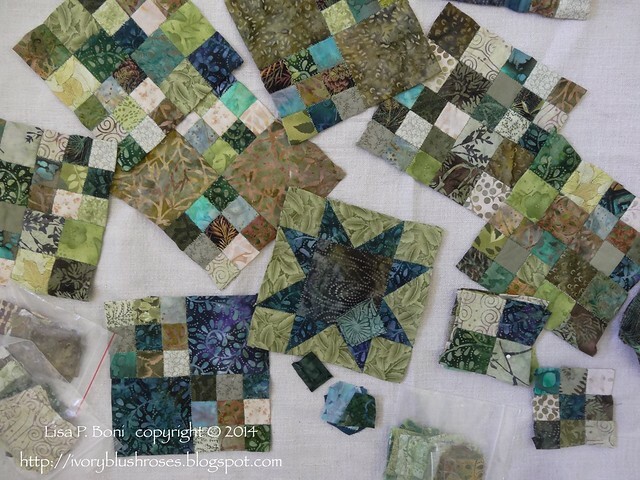 I love taking a block that someone else has pieced and watching it come to life. If I am further into a round robin, then there is the added challenge of making the block I am working on blend with the work that has come before it. All of this stretches my creativity and often become my best work. Regardless of what project I am working on, it's always a learning process! 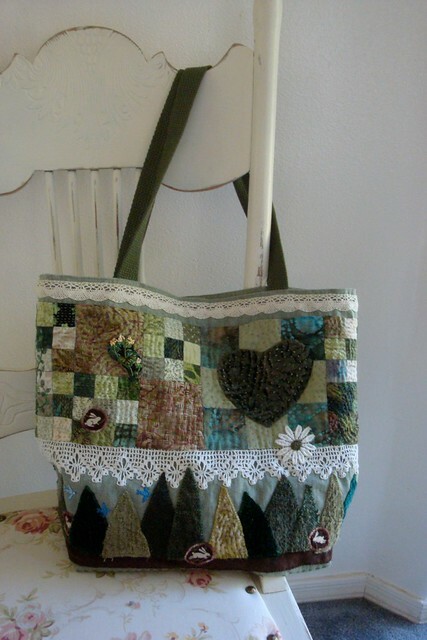 A new stitch to try, a new technique to learn, new materials to work with and new projects to work on. My tendency is to want to work small and I've done so many small projects in the past few years. In this coming year, I hope to reach out and work on a couple of big projects and see them through to completion! I'm also hoping to branch out into teaching. I had such a good time with the two short classes I did at the CQI retreat in September and had great feedback from them! I'd love to do more! 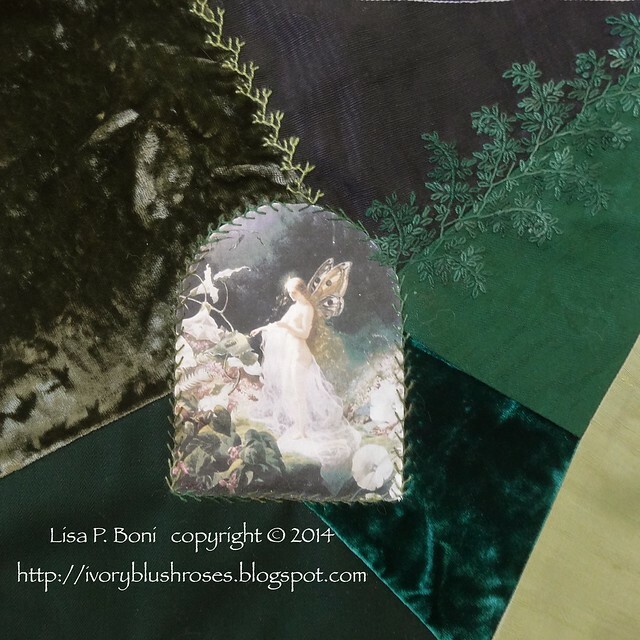 To carry this Around the World Blog Hop on, I nominate the following crazy quilters/Needle artists, who are favorites of mine and many others! What a lovely post and such a joy to read and also to be able to re-visit some of your work. 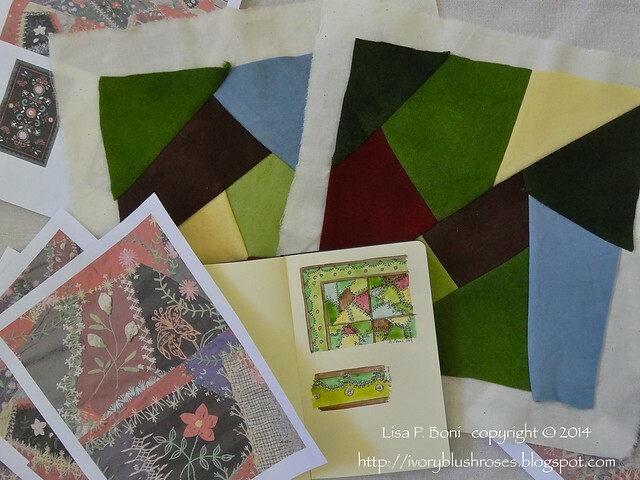 This was a wonderful post to read with lovely photos of your wonderful work and ideas come to fruition. You are such an inspiration to me, and your post is just what I needed this morning. 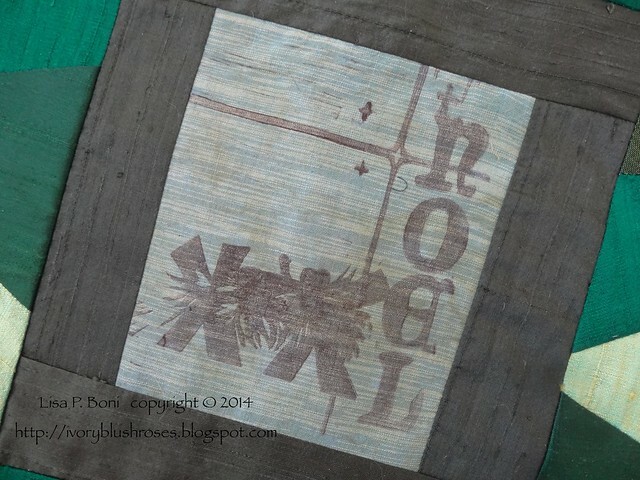 I also love the stitching on crazy quilts. They seem to make the whole piece a thing of real beauty. Wonderful post! I especially loved to see that you are big on the stitching (esp. seam treatments), as for me too, that is what CQ is all about. Since joining a couple of groups I have found it is not that way for so many - as you say, the focus seems to be embellishment. I did my first few RRs, and was quite surprised to get blocks back with very little in the way of seam treatments - in some cases no seam treatments at all! Just embellishments. I have so enjoyed seeing your work over the last few years. I am uplifted with all your postings not just the stitching (but those are my favorites). You have been very generous with your art. Your work has inspired me to go more stitching on my work. Thank you. Lisa, this was such a wonderful post. I was really happy to meet you at the CQI retreat earlier this month. Even though I knew we had similar interests previously, after meeting you and after reading this find we really do have a lot in common. I'm excited to be in a round robin with you and participating in my first RR. What a lovely post! Your work is beautiful and I always admire your seam work. It has been so much fun to be in a round robin with you, and to see your work in person. I look forward to seeing what you do with my block - I am guessing you chose the "O" pictured above?! Gerry and Margaret do such gorgeous work,too. Thank you for sharing! Lovely post. Your work is beauitful and inspiring! I always enjoy your blog Lisa but this one was particularly enjoyable. Going back seeing some of your past work and your wonderful collection of pincushions. You are smart enough to know when you need a rest and can only handle so much. I often wonder how you do what you do. Have a great time at your son's wedding and will be looking forward to your return.